Hey Everyone! 🙂 It’s been a while since my last post but it feels good to be back. Fall is my absolute favorite season; everything about it is great from the crisp air, to the leaves changing colors and hot drinks. I love fall fashion and styling fall looks. My favorite thing to wear in the fall season is a good sweater, and my closet is full of them in all types of colors. 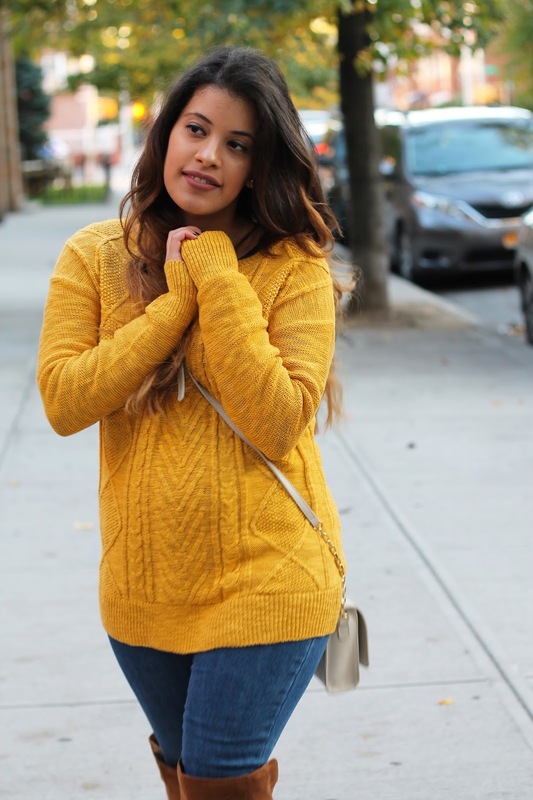 I had wanted a yellow mustard colored sweater for a while because I think it’s a perfect color for fall and I was so happy I found this one at Target for only $20. It is so warm and cozy. Also, the material is great for the price. It comes in six other colors too! I may or may not have gotten a couple of other colors too! 😉 They are currently on sale for buy one get one 50%off, seriously such a good deal! My Lulus jeans are so comfy and I love the skinny fit as well as the wash color. So, I am obsessed with my DV over the knee boots! I had been eyeing a designer pair that was over $200 but thanks to Target, again! I found these practically same exact ones for only $50 and they are currently on sale for $40! Don’t forget to thank me later, and your bank account will too! These boots are the perfect color for fall and a definite need in your closet. 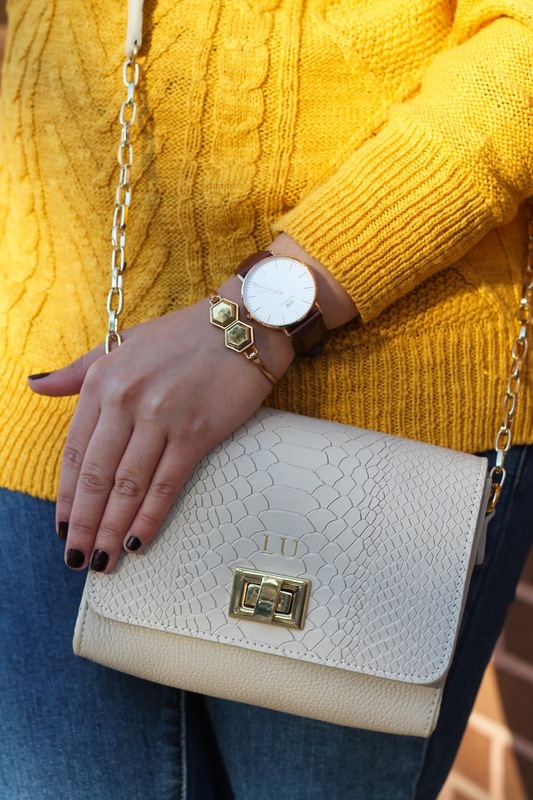 To complete this fall look I added my Gigi New York Catie Crossbody bag which, is just the perfect color for any season and the perfect size to carry your most important essentials. (Did you see how cool my initials look on the bag?) 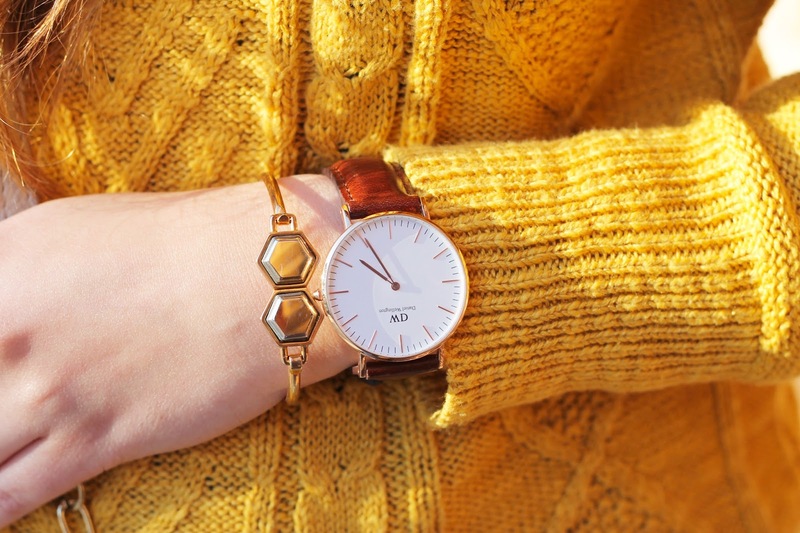 Of course my Daniel Wellington watch is also the perfect accessory, I love how well the brown leather of the watch looks paired with the yellow pullover sweater. 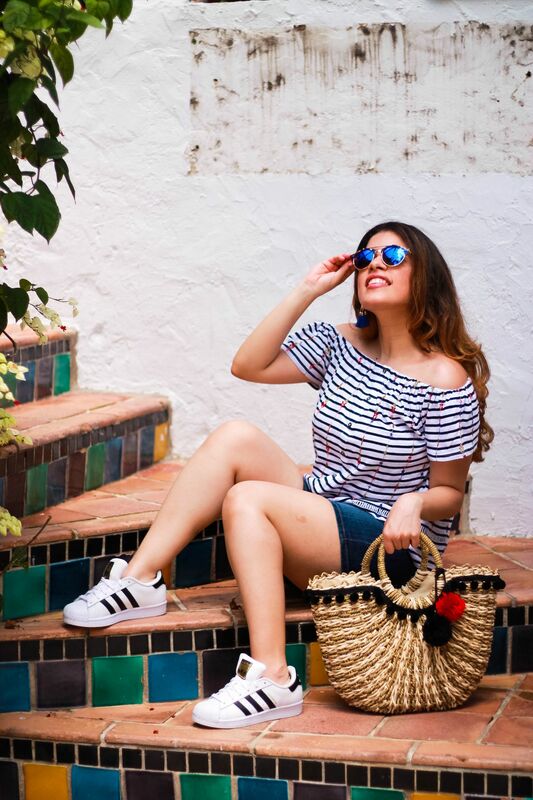 What is your favorite thing to wear in the fall? Let me know in the comments below. Previous Post Two Summer Looks With Shop Tobi: Distressed Skinny Jeans with a Flowy White Cami Top & A Blush Colored Swing Dress. Next Post NYP Turns Two; Green Long-Sleeve Top and a Black Button Skirt with Over-The Knee Boots. Aww Thank you Ruthie, you are so kind! Hope you are having a lovely weekend! I loved the color on Instagram, and I love it just as much here! You wear that shade of yellow so well! And the color of those otk boots look great with it! First of all, I'm so jelly you live in New York, love that city! And girl, you're gorge! That happy yellow sweater looks great on you, I'm a big fan of bright colors. And thanks for the tip on the $40 boots, I've been wanting a pair and for that price I might just get it today. Aww Nicole you are way too sweet! Thanks girl! & yes it really is such a good deal for these boots and they come in black too! 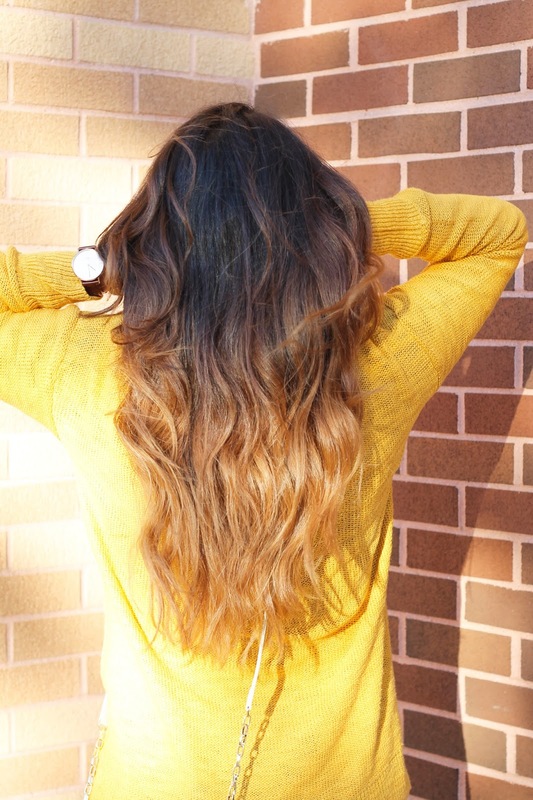 i love a good mustard colored piece! You look lovely in this color! 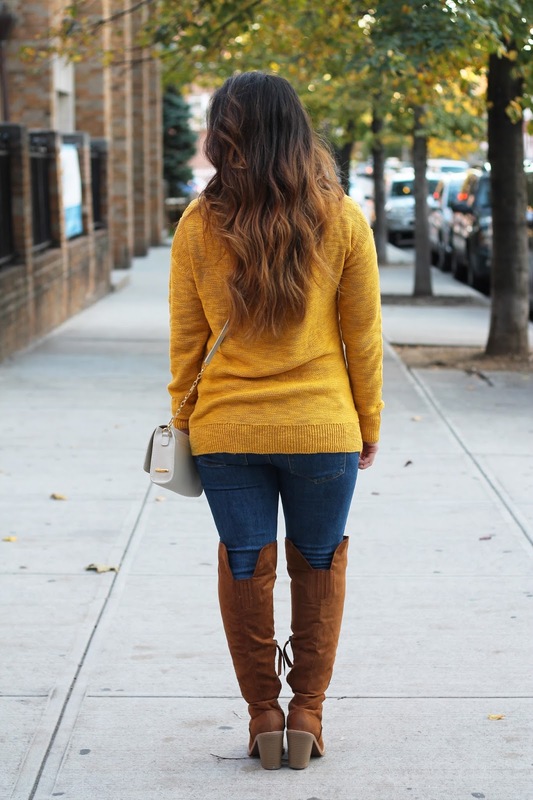 Perfect combo of sweater with over the knee boots! 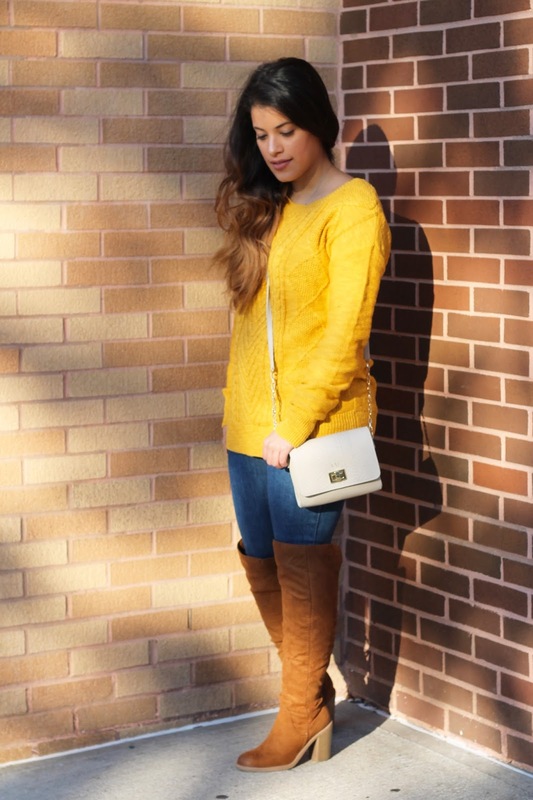 This sweater boot combo is the definition of autumn!! Love how happy and cozy this outfit looks. Target really does have everything a gal needs in life haha. I finally found some otn boots I love and I'm so excited to start wearing them. Yes! Target is life Meaghan haha 🙂 Thank you so much girl! i hope you are having a lovely weekend!